Storage: Refrigerate corn until ready to prepare it. 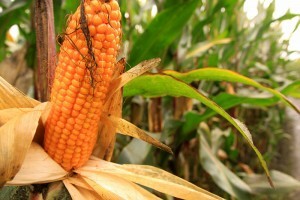 Some varieties of sweet corn can lose half their sugar content in one day if kept at room temperature. Leave the husks on to retain moisture. If the ears are already husked, place them in a perforated plastic bag. If you have more corn on hand than you can use in a day or two, parboil it for just a minute or two and refrigerate it up to three days. To complete the process, just drop them into boiling water for one minute. Or, cut the kernels from the cob and then refrigerate. Preparation: Unless you are grilling or roasting corn in the husk, strip off the husk and snap off the stems (or leave the stems on to use as handles). Pull off the silk, using a dry vegetable brush to remove strands between the kernels. To remove corn from the cob, hold the cob vertically, resting the tip on the work surface, and slide a sharp knife down the length of the cob. Nutritional Benefits: Corn is a source of fiber, magnesium (regulates biochemical reactions in the body), phosphorous (important for the formation of teeth and bones), thiamin (helps the body's cells change carbohydrates into energy), and vitamin C (for immunity).